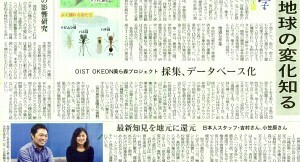 Ryukyu Shinpo, an Okinawan local newspaper, reported on the OKEON project in its education section on January 29th. The article describes the project in depth, from the importance of biodiversity with an emphasis on insects and the project’s role in furthering our knowledge, to the technological aspects of the project including the use of databases and weather stations, to the process of setting up the network including communicating with collaborators, planning the sites and setting up traps. OKEON project not only serves as a monitoring network of the terrestrial ecosystem in Okinawa, it also exemplifies one of OIST’s goals of “Contributing to the promotion Okinawa (沖縄振興への貢献)” as the project provides local knowledge back to the local people. In particular, the article emphasized the role of Masashi Yoshimura and Masako Osagawara, a staff scientist and a technician of the Economo lab, as they served as links between the project and the local people. For example, they have involved local high school students in the project and taught them about insect biodiversity and collecting methods.